When art is put into a logo, the meaning of logo is not only simple existence. They celebrate Pac-Man anniversary, Einstein’s birthday, World Cup, American Independence Day, the Persian New Year, the Olympics, U.S. presidential election…they commemorate history, record today and look forward to the future. Who are they? Yes, they are Google Doodle artists. What they in charge of is to display special events by means of Google logo. 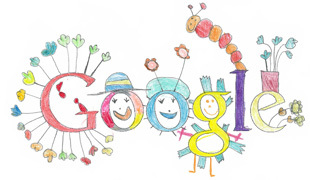 The versatile artistic skills make the whole team cater to the Google culture. For the sake of working out the Google logo design that will please the whole world, they have to exchange ideas with the engineers. Frankly speaking, Doodle is work for Google; precisely speaking, Doodle is on behalf of the whole world but not for special festivals or special events in special countries. So during the creating process they have to take people all over the world into account. They need to figure out the technique that can show up the concept and then think of some interesting ideas. The team has to create about as many as 200 doodles and each is engraved with Google technological and cultural identities. It is quite strict for Doodle to express an event accurately for once it is done in a wrong way, they whole world will remind them immediately. Take the DNA doodle for an example, numerous scientists write to them when the double helix structure is drawn in a wrong way. They correct the mistake and from then on they become more careful. In drawing the PI Commemoration Day doodle they bring it to Princeton doctors for checking in case of a second-time mistake. Google has never been a corporation that lacks of originality. The usage of Google Logo has applied for a patent recently. The stylish logos can always bring us with surprise in everyday Google. In the following there are Google logos since 2011 which will definitely feast your eyes. If you like it you can also add it to your homemade videos for self entertainment when you carry out video editing.